I saw this in a magazine not so long ago - have forgotten which one, sadly - and decided to give it a go. 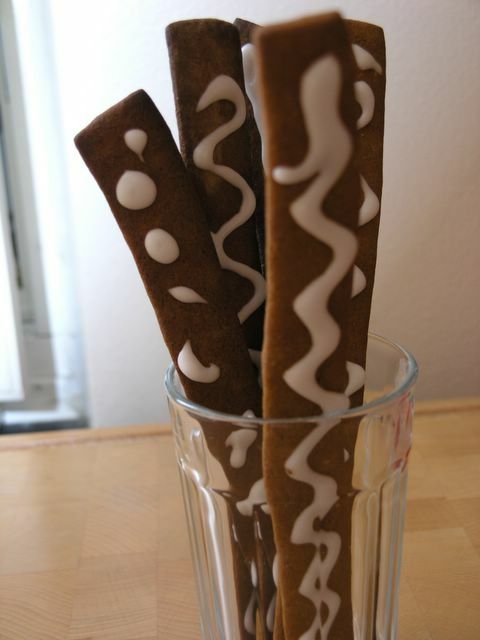 Pepparkakor - Gingerbread Cookies - are very seasonal here and really big in December. I served this along with some warm spiced apple cider for Thanksgiving, and it was a huge hit. 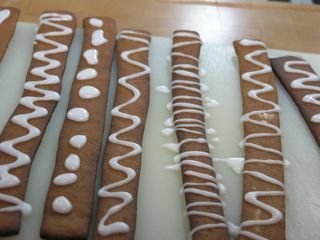 I used ready made gingerbread dough, but feel free to make your own if you can't find ready-made. So. Get your dough. Roll it out on a well-floured surface. Make it slightly thicker than you normally would, or it will be really difficult to transfer the grissini to the baking sheets. Transfer to sheets, and bake for a couple of minutes in a medium-hot oven. (About 175°C) They burn very easily, so watch them! Then make a sugar paste from 500 ml powdered sugar, 1 eggwhite and a few drops of lemon juce. Place in piping bag and decorate to your heart's delight. Per now refers to this as our "Gingerbread Vase". I agree with Emma, this is such a cool idea! We always have loads of "piparkoogid" alias peppercakes alias gingerbread during Christmas, but they are usually heart and star shaped. Your grissinis look much cooler. Thanks for sharing the idea! Such a beautiful, simple idea! I would never have thought to shape them like that. Very beautiful, Anne! 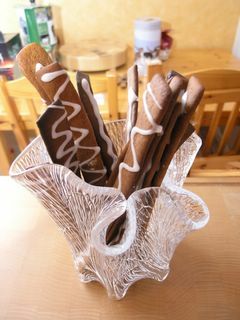 I actually have a vase that is quite similar to your "gingerbread vase", so perhaps it is time to rechristen mine, too. WOW! Beautiful and simple to make. I have to try that! I really love this idea. They look beautiful. I LOVE this idea! I'm going to use your recipe for pepperkaker this weekend. When we lived in your neck of the woods there was a grocery store that sold the dough from their bakery. It was the best around! Jammi :-) Snygg blogg. Ses & Hörs!